If you like a sweet flavor to your cocktail, these fruity beverages will please your palate. From martinis to tropical drinks, there exists a wide array of alcoholic beverages for fruit lovers! The appletini - or Apple Martini - is a crisp blend of apple-flavored liquor, apple juice, Cointreau, and vodka. This bright green drink is both powerful and refreshing. This bright green drink has the flavor of melons and coconuts. Pour in Midori, coconut rum, and sweet and sour. Top off with lemon-lime soda. If you like a little sweet and a little sour in your fruity drinks, then you'll love the lemon drop martini. Made with lemon juice, simple syrup, vodka, and a rim of sugar, the lemon drop tastes like a cocktail version of the candy. Enjoy these tasty shaken margaritas on a hot summer day. Rim a margarita glass with salt. Sangria is a sweet and delicious red wine punch filled with fruit. It also contains rum or other spirits to make the punch refreshing and interesting. Few drinks are better than a fruity punch combined with delicious rum on a hot summer day. This Caribbean Rum Punch with pineapple and orange juice recipe is sure to hit the spot. If you like strawberries, then you'll love the sweet fruitiness of the frozen strawberry daiquiri. This blended drink is bright, sweet, and refreshing. If you don't like an overly sweet fruity cocktail, then the Sea Breeze is for you. Add cranberry and grapefruit juice. Made with blue curaçao, coconut liqueur, and rum, a Blue Hawaiian is an electric blue drink that reminds you of the blue skies and seas of the Islands. The Singapore Sling is a popular fruity drink made with gin, grenadine, and cherry brandy. Add grenadine to a tall cocktail glass and fill it with ice. Fill nearly to the top with equal parts sweet and sour and club soda. Top with cherry brandy. Do not stir. 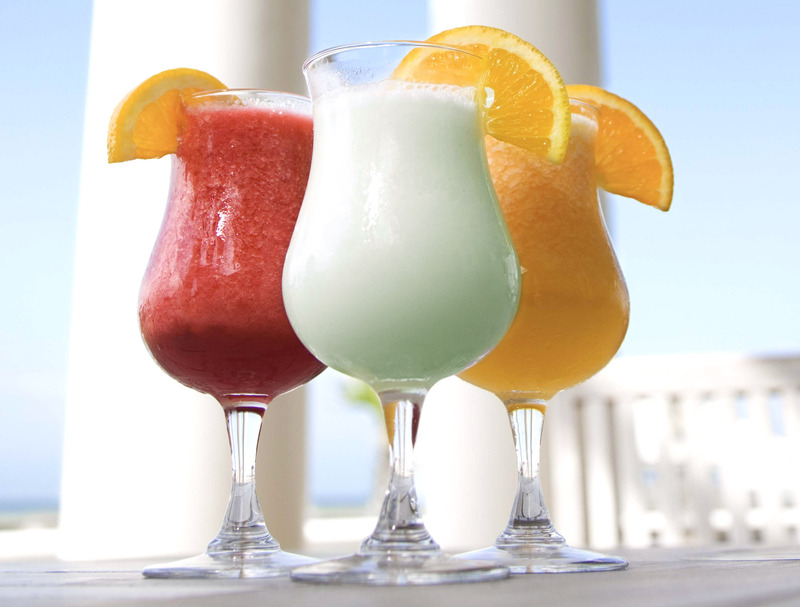 A frozen blended drink, the Miami Vice is a combination of a strawberry daiquiri and a piña colada. The layers make it look just as good as it tastes. Make a pitcher of this delicious peach sweet tea that has a bourbon kicker. Combine tea, simple syrup, bourbon, peach nectar, and lemon juice in a pitcher. Place two peach slices in a glass and fill the glass with ice. Pour tea into glass. Garnish with a sliced peach and a sprig of mint. This peachy cocktail is made from peaches and bubbly. While the Bellini is a fruity drink that can be served blended, it's also a brunch mainstay and one of many cocktails made from sparkling wine or Champagne. Regardless of what your favorite fruit is, there are plenty of delectable cocktails to enjoy!